Subtracting Christianity, 1979 — I am sometimes asked, when in conversation it transpires that I oppose abortion, whether I am a Catholic. That this is deemed a pertinent question is a mark of confusion — and of the success of the pro-abortion campaign, which has managed to get an ethical and political problem turned into a credal problem. The result has been to further embitter an already thorny issue. By now that campaign has popularized the proposition that “when human life begins is essentially a religious question.” Accept this, and it follows that those who have no religion can’t pretend to know the question’s answer, and hence can have no grounds for opposing abortion. A further (and more important) consequence is that a nation which eschews the establishment of religion has an actual obligation not to prohibit abortion. And from this it follows that those who seek to legislate such a prohibition are unassimilable to the form of the polity. Or, not to put too fine a point on it, they are constitutional pests who want to “impose their views” on everybody else. But that proposition, in the first place, is a cliche. Every human life, like every canine and bovine life, begins at conception. Modern embryology has learned far more than Aristotle or Aquinas could have guessed about this. The whole fascination of Louise Brown is that her life, a manifestly human life, began in a test tube, where it would be stretching words to say she was part of her mother’s body. Had she been implanted in a cow’s uterus she would not have developed into a calf. As soon as her life began it was a human life. That it could not have continued outside a human mother hardly refutes this point. Nor is it obvious what one’s views on the supernatural have to do with facts so transparent. More sophisticated advocates of abortion say that the question is at what point the fetus is “fully” human. This at least acknowledges that we know far more than our ancestors about the continuity of life. Each of us was once a mere embryo, a mere fetus, a mere infant. Embryology is hardly likely to locate a better defining point than conception. The problem is to find moral reasons for distinguishing one phase of life from another for purposes of protection. Can a human life be too trivial to protect? One philosopher, Michael Tooley, admits that life begins at conception and that it is nonsense to say what humans conceive is not human life. But he proposes as the best criterion of protection- worthiness (or what some call “full” humanity) the capacity for self-consciousness, for awareness of the self as distinct from other persons, that emerges a few months after birth. On this basis Tooley justifies not only abortion but infanticide. His solution may be horrifying, but it is consistent. Above all it does not pretend that only religion can answer what is essentially an ethical question. Because the Catholic Church has taken an official position on abortion, many find it convenient to reduce the issue to religion. Some of them make thinly-veiled appeals to religious prejudice (or anti-religious prejudice). Others who don’t stoop to this have nonetheless sought to identify the anti-abortion movement with the Catholic Church. This reveals confusion about religion. Not even the Catholic Church has made opposition to abortion an article of faith or “dogma.” Its position appeals to what it calls “natural law,” or moral reasoning that is independent of divine revelation. This should be obvious enough. Catholics are notoriously among those who try to excite horror against abortion by showing pictures of mutilated fetuses. Whatever one thinks of this, it is not an appeal to faith in things unseen or submission to authority. Like pictures of My Lai, it is an ingenuous appeal to our (natural?) loyalty to humanity. It may be simplistic. It is not in the least sectarian. On the contrary. Why is this so hard for many Americans to understand? Perhaps because most of our non-Catholic religious traditions do depend on revelation for their moral codes, with the result that even popular secularism, rejecting revelation but retaining the Protestant exaltation of individual conscience, finds it hard to grasp a critical moral objectivism. This whole American moral tradition is itself dogmatic –unconditional, not susceptible to moral reasoning-and the assertion that abortion is strictly a religious issue is a dogmatic assertion. I know of no grounds for believing it; I have never heard any presented. Even among non-believers it can only be an article of faith. This mentality, which presumes that only a faith like its own can animate opposition to abortion, has made it awkward for anyone whose view resembles or coincides with Catholicism’s. No matter what he says, no matter what reason he gives, if his view is the “Catholic” one he faces impregnable skepticism: he is thought to be making rationalizations for repeating what the Catholic hierarchy says. He must strain to show that he has found his own reasons and state them in terms that don’t “sound Catholic.” It helps, if his listeners aren’t utterly bigoted, if he can say he isn’t a Catholic. He must overcome a kind of psychological guilt-by-free-association with Catholicism. These are code-words for an all-too-familiar American bogey, the Catholic power-grab. Liberal opinion-leaders used to denounce this kind of appeal in 1960, but apparently they did so only because they perceived John Kennedy as one of their own. To the extent they are not directly guilty of it, they are guilty of tolerating it — as they emphatically do not tolerate appeals to fears of marauding Negroes or scheming Jews. They did not see the Reverend King as a menace to the separation of church and state; they do not raise troubling questions about whether support for Israel reflects special religious interests. Why, then, have they been so cruelly indulgent of the insinuation that the anti-abortion movement is essentially an expression of the constitutional insolence of the Catholic Church? Single Issues: Essays ... Joseph Sobran Check Amazon for Pricing. The irony is that the anti-abortion cause was doing very well in referenda as late as 1972. And what it has sought to do since has been not to “impose its views,” but to restore, through persuasion and democratic process, laws passed through the same means (and by non-Catholic legislatures, if that helps); laws suddenly struck down in 1973 by seven men out of two hundred million. When the Supreme Court is voting progressively, liberals seldom complain — or notice — that a tiny minority is imposing its views. In fact judicial fiat and bureaucratic directive have become the preferred liberal modes of doing business with the American people. We are now hearing the argument that the right to abort is somehow implicit in the First Amendment, as a free exercise of religion. Perhaps the same case could be made for human sacrifice in general, but that is neither here nor there. The humanitarian case against abortion deserves to be considered on its merits, which, such as they are, would stand unaffected if the Pope made abortion a sacrament. And Catholics deserve to be listened to, on this as on other subjects, with as much fairness and candor as if they were non-Catholics. The bottom line of all government is compulsion. Unless a whole nation could be unanimous, this must always mean the imposition of some people’s views on others who do not accept them. Yet the project of American politics has always been to keep compulsion at a minimum, and to keep before us the ideal of government by persuasion. This requires an ethos of fair and civil discussion. The sad fact is that American liberals, normally eloquent champions of free speech, have in this case, by countenancing and encouraging the defaming of anti-abortion forces and the misrepresenting of their goals, done much to corrupt that ethos. 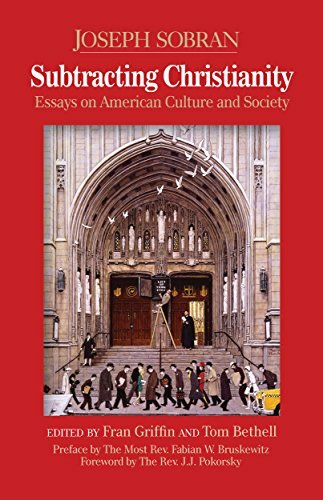 This article is one of 117 essays in the anthology of Sobran’s columns titled Subtracting Christianity: Essays on American Culture and Society (FGF Books, 2015). 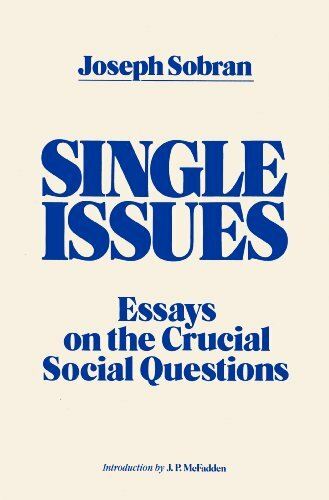 It is also available in the collection of Sobran essays, Single Issues: Essays on the Crucial Social Questions. It was published originally in the Spring 1979 edition of Human Life Review. Joe Sobran was a brilliant writer. See bio and archives of some of his columns.